On 8 April 1954, Flight 201 departed Rome for Cairo and Johannesburg. The flight was used with a leased British Overseas Airways Corporation De Havilland Comet. The aircraft crashed off the coast of Italy killing all 21 people onboard. Along with BOAC Flight 781, it was one of two Comet crashes caused by a flaw in the design. South African Airways Flight 201, a De Havilland Comet 1, took off at 18 32 UTC from Ciampino Airport in Rome, Italy en route to Cairo, Egypt, on the second stage of its flight from London to Johannesburg, South Africa. The flight crashed, killing all aboard at around 19 07 UTC on 8 April 1954. The flight was operated as a charter by British Overseas Airways Corporation using the aircraft G-ALYY , with a South African crew of seven, and carrying 14 passengers. Gerry Bull and other BOAC engineers examined the aircraft for Flight 201. 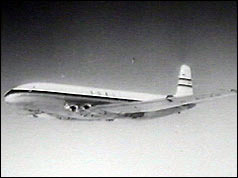 Previously the same team examined BOAC Flight 781 prior to its final flight. Thirty-five people are missing, feared dead, after a Comet jet airliner crashed into the Mediterranean. The plane - a British Overseas Airways Corporation jet - was on its way from Singapore to London. It came down in the sea about 20 minutes after taking off from Rome, in Italy, on the last leg of its journey. Fifteen bodies have been recovered so far. There were 10 children among the passengers. World War II correspondent Chester Wilmot, was also among those missing.